the clear alternative to traditional braces. Conveniently located at 61 Bowes Street, Dr. Lahti’s dental practice offers a professional series of invisible, clear plastic retainers called Invisalign®. Braces have come a long way. Book an appointment for a free consultation soon to discuss your options. If you or a loved one needs braces, you’ll be happy to learn that there is an alternative to traditional metal braces for getting your teeth straighter. Traditional metal braces have been used for decades to straighten teeth. However, metal braces have several disadvantages. First, the metal wires can be painful if food gets trapped or the strings partially unwind. This means that there are several hard, dense and sticky foods that must be avoided while wearing braces. It’s also more difficult to clean your teeth, which leads to incomplete brushing and flossing. Wearers of braces must visit their dentist frequently for professional dental cleanings and appliance adjustments. Another drawback is that you have to get used to having metal in your mouth, which makes for unattractive pictures. 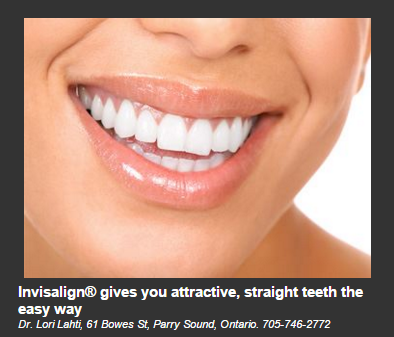 Lucky for you, Dentistry on the Bay only offers Invisalign®. Invisalign® offers you a whole new world. Imagine that you can take countless selfies and no one would know that you had anything in your mouth. Invisalign® clear plastic retainers are totally discreet. Wear them with confidence to school, work and social events. Smile your biggest smile. No one would guess that you’re secretly straightening your teeth. Another advantage offered by Invisalign® is the ease of use. Conveniently remove your trays at mealtimes and for thorough brushing and flossing. Your teeth and gums will be healthy, and you’ll be happy with the results. Over time, your dentist will advise you to use specific Invisalign® trays until your bite is corrected. Dr. Lori Lahti welcomes new patients of all ages. Visit the office to discuss whether Invisalign® is right for you. In addition to Invisalign®, their office offers routine cleanings, fillings, dentures and implants.